Fall Into First: Ice Cream CRAZINESS! My maternity leave came to an end and I went back to work this week :( It was really hard to leave my sweet little baby, there were several days this week of driving away from the babysitters house in tears. I had heard from my teammates that my class may need a little "help" with their behavior when I return so I pulled out my ice cream unit early. I usually use this unit at the very end of the year to keep those little kiddos behavior on track until the end of the year. But desperate times call for desperate measures! So here is a look at our ICE CREAM week! 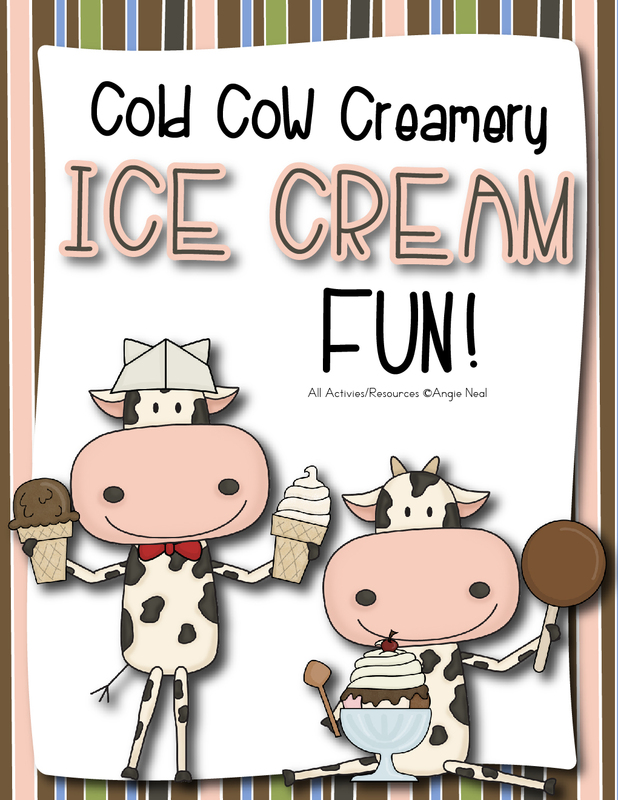 To begin our week, the kiddos were given a Ice Cream Behavior Challenge page. In order to participate in our Ice Cream party at the end of the week students had to earn green and blue lights for the week. 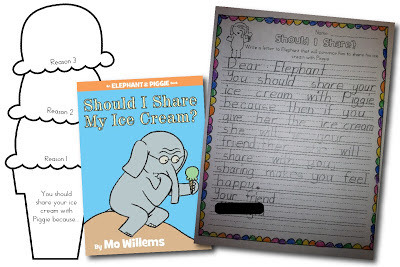 We used the writing lines on the right to review our classroom behavior expectations and explain the rules of the Ice Cream Behavior Challenge so parents could read all about it. When the kiddos came in on Monday there was a envelope taped to the whiteboard. 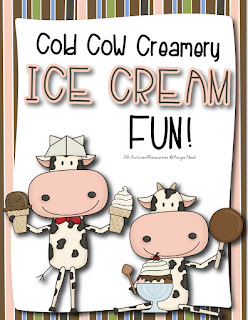 It was addressed to Mrs. Neal's First Grade Class from Cold Cow Creamery. The kids were given a planning sheet to brainstorm the ideas for their new ice cream flavor then they began writing. I love this time of year because their writing is amazing and you can totally see their personality coming out in the writing. I loved the use of the word "epic" in the picture below. 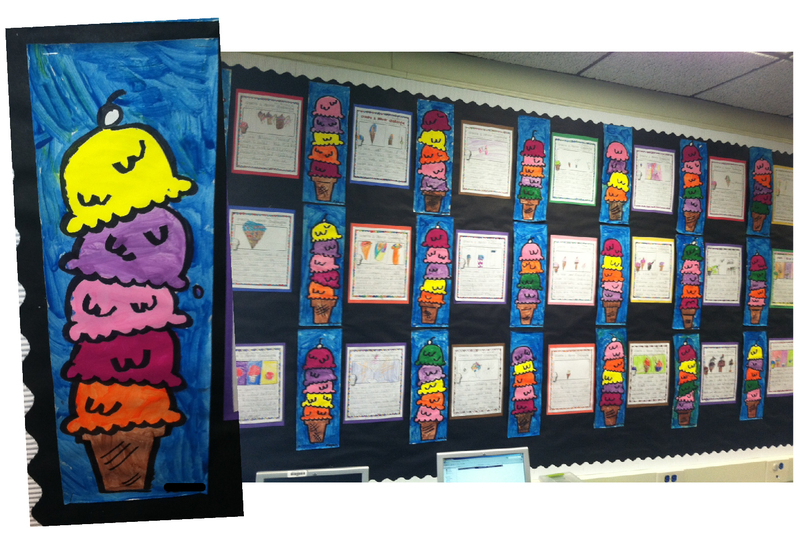 We did a guided art drawing of an ice cream cone and students painted their ice cream to display next to their new ice cream flavor. 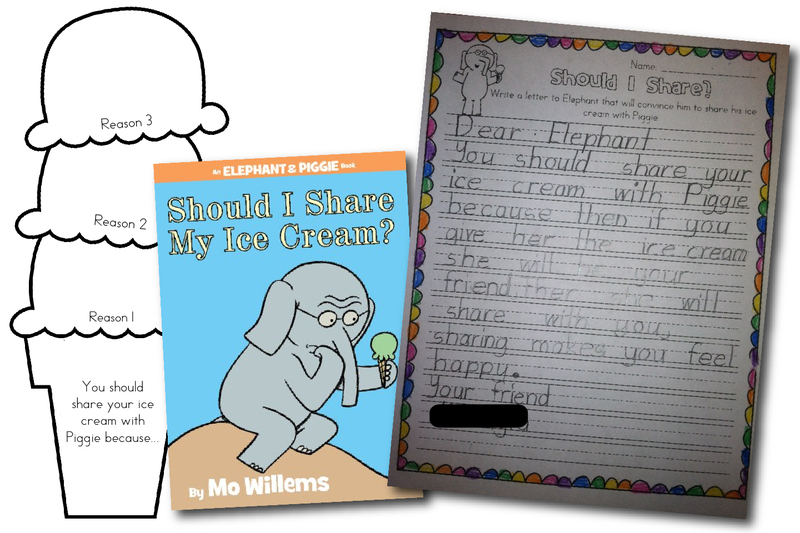 We LOVE Mo Willems so we also used an Elephant and Piggie book called "Should I Share My Ice Cream?" to complete a persuasive writing piece. 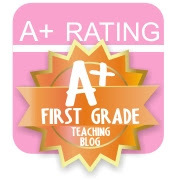 We also reviewed and learned about Fact and Opinion, ABC Order, Adjectives, Building Words, Fractions, Measurement, Fact Families, Addition, Subtraction, Graphing and Solving Word Problems. WHEW! What a CRAZY fun week! The kids had a blast and they were super motivated to behave and earn their ice cream party that I had a wonderful week too! I put all of these activities into a packet for you, check it out here! It is 74 pages of fun! Sorry you had to leave your bundle of joy.. but your firsties are SO lucky to have you too. I love your Ice Cream Unit! Adding it to my cart as we speak! 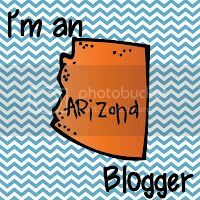 It is so nice to find you, and your precious blog today! I want to follow but did not see the big blue button...Did I miss it?